The other morning Murphy and I awoke to a winter wonderland. She ran out to make sure that she was the one to thrash up all the fresh snow out in the yard. She is just like me in that respect. She loves the snow as much if not more then me. Murphy took great care to make sure she tracked up every untouched patch of snow between our condo and the big field that we play fetch in. 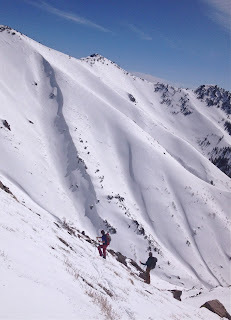 We have also already scouted a slope in the hills that will be the site for her first downhill powder run this season. We will be getting into some XC training this season and she is ready to get after it. Her powder pounce got pretty honed in last season as a little pup and now she is ready for some low angle downhill. Murphy is the surprise show stopper in the newest TGP "Harmless" television series release. 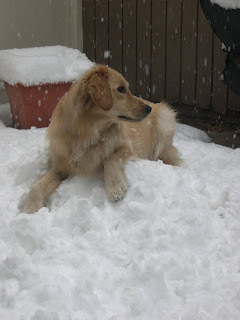 This January 50 million people will be able to watch Murphy fetch her toy in the some fresh snow during her short cameo in the Utah segment. She is a natural. Christine said our movies need more puppy so maybe I'll have to get Murphy an agent and start pimping her to the industry for logo time. She'd probably get more sponsor love then me.